Hello and welcome to the 103rd installment of the SWD. Syrian Arab Army advanced in eastern Aleppo against Islamic State and captured the village of Al-Sakouriyah, just northwest of Maskanah. In the village of Al-Bouajouz, west of Maskanah which was captured by SAA yesterday, IS destroyed SAA‘s tank with an anti-tank guided missile. Syrian Democratic Forces repelled Islamic State’s attack on Maysaloun village, northwest of Raqqa. IS’ attack lasted more than a day, but didn’t achieve anything, only cost IS at least 20 fighters. SDF then launched a counterattack northwest of Raqqa and destroyed one of IS’ weapons depot, 2 kilometers (~1.24 miles) from the city of Raqqa. Vehicle belonging to Jaysh al-Nasr, part of the Free Syrian Army was targeted by a landmine, west of Khan Shaykhun. Information about any possible casualties is currently unknown. Yesterday’s reports about SAA capturing Al-Ulainiyah and surrounding mountains from Maghawir al-Thawra and other US-backed Free Syrian Army factions turned out to be false. The area is still held by the various Free Syrian Army factions. Northwest of Zaza checkpoint, Syrian Arab Army captured air defense base, which is around 11 kilometers (~6.8 miles) from Zaza. An improvised explosive device targeted the car of Abu Hasan al-Masalma in rebel-held Daraa al-Balad. Al-Masalma is a commander in Liwa al-Tahwid, part of the Free Syrian Army. 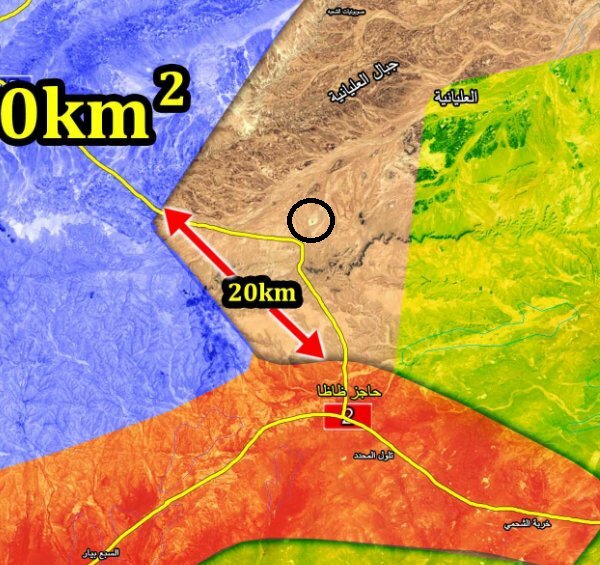 Free Syrian Army’s offensive called Desert Volcano which was announced on the 22nd of May kicked off, first target apears to be Al-Zuluf area between Al-Suwayda and Damascus governorates. Some of the groups confirmed to be participating are Jaysh Usud al-Sharqiya, Liwa Shuhada al-Qaryatayn and Quwwat al-Shahid Ahmad al-Abdo. Offensive still hasn’t made any significant territory advances, but since the start of it, rebels reportedly destroyed a tank and two artillery pieces. 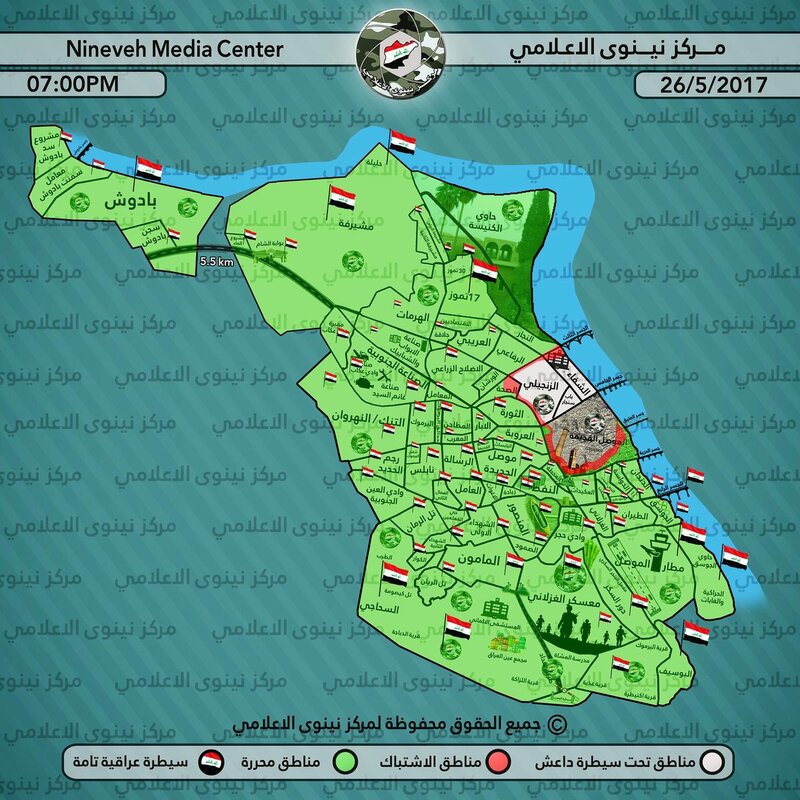 Islamic State concluded another “successful” day in west Mosul as they’ve managed to keep all of their territory, for now. Iraqi forces are preparing for the final assault in west Mosul, which may start at any point, so it is very likely that IS won’t be in west Mosul for much longer. Islamic State’s SVBIED targeted the gathering of Iraqi forces in Al-Rifai district, at least one Humvee was reportedly destroyed in the explosion. IS’ snipers in west Mosul allegedly killed at least eight Iraqi soldiers in Al-Najjar district and in Bab Jadid and Bab al-Bid neighborhoods, Old Mosul district. Al-Hashd al-Shaabi (Popular Mobilization Units) advanced north of Baaj capturing several localities from Islamic State and cutting the road between Baaj and Sinjar. Captured localities include Sinjar Military Base, Sinjar Domuz and Rambus Sharqi. In the captured village of Rambus, Amaq claimed IS’ SVBIED hit the gathering of Al-Hashd al-Shaabi’s fighters. According to Amaq Agency, Islamic State’s sniper killed two members of Al-Hashd al-Shaabi southwest of Kirkuk. Islamic State targeted Iraqi Army’s Humvee and bulldozer with RPGs on the road between Baiji and Haditha. Last night, an explosion rocked Al-Mushtil district in Baghdad, shots were fired after the explosion occurred. It is unknown if there were any casualties from this incident. According to the Embassy of the United States in Baghdad, three senior Islamic State commanders were killed in Iraq and Syria. Nom de guerres of the killed commanders are Mustafa Gounis, Abu Assem al-Jazairi and Abu Khattab al-Rawi. CJTF-OIR‘s latest news release reported the death of a US service member in northern Syria on the 26th of May. Service member died of injuries sustained during a vehicle roll, further information will be released soon. On the 25th of May 2017 CJTF-OIR has conducted 19 strikes in Syria. CJTF-OIR‘s main focus in Syria at the moment is Tabqa-Raqqa-Deir al-Zour region where they did 14 strikes supporting SDF‘s operation against IS destroying seven IS oil trucks, four IS barges, an IS well head, a command and control node, an ISIS headquarters, six fighting positions, three vehicles, a tactical vehicle, and a mortar system. Other areas where five strikes occurred are Abu Kamal, Al-Hawl and Palmyra destroying an IS well head, a vehicle and three VBIED facilities. Full report on CJTF-OIR strikes conducted in both Syria & Iraq can be found here.